Merpal_6165 is a low poly tris toon-style mer-folk figure created by Nursoda. Merpal_6165 is a free figure and one can download a copy of Merpal_6165 on Renderosity Freestuff. This is a stand-alone figure. You do not need a copy of the full version of Merpal to use Merpal_6165. Merpal_6165 comes with a variety of poses and animations. The poses included with Merpal_6165 can be used on the full version of Merpal and vice versa though not all of Merpal's poses will completely translate over to the free lo-poly tris version. Merpal_6165 lacks many of the full version's morph capabilities and cannot take the full version's expressions. Skins made for the full version of Merpal can be used on Merpal_6165. This page is based on the list of freebies for Merpal_6165 as it is maintained on the 3D Noir Nursoda Freebie Master Compendium. The maintainer of that list has posted this information here. 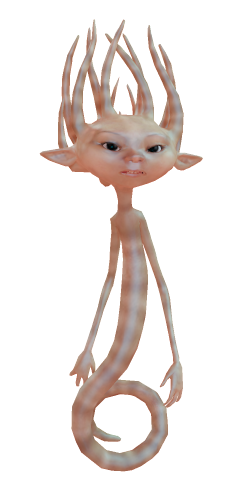 Merpal_6165 is created by Nursoda and distributed on Renderosity Freestuff. Merpal_6165 is licensed for non-commercial use only. This page was last edited on 2 October 2018, at 14:05.